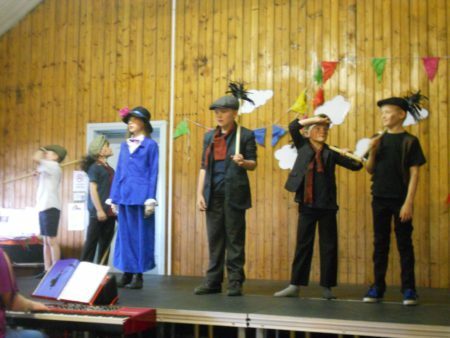 Our children enjoy a wide range of extra curricular fun when they join one of our activity clubs. You can learn more about them and follow what they get up by visiting this page regularly. The Stone Age shelter in the Secret Garden needed some repairs so Mrs Davies asked Art Club to create some ( fake) reindeer hides to recover it. After a quite look on a google image the children set to work on some pre-cut canvas with the acrylic paints. brushes, card combs, twig brushes and eventually hands all added to the effect and we think they are quite effective. We can’t wait to see what they look like on the Stone Age hut! 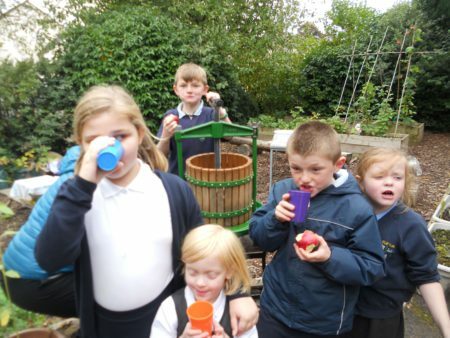 Outdoor Club children worked brilliantly together to wash, dry, chop, mash and then press the apples. We all agreed that the apple juice was delicious and just about worth all the hard work. There is a very excited buzz around school last thing on a Friday afternoon when a coach from Carlisle United leads a training session for our children. Our first session of the autumn was very exciting – with time spent in the Secret Garden. 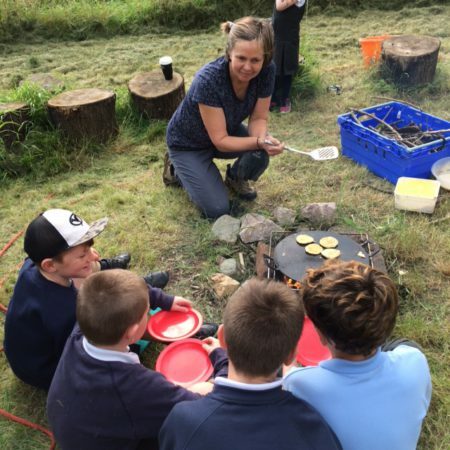 Mrs Davies made a campfire and the children helped make pancakes which were cooked over the flames. We even made a plum jam from the fruit growing there. 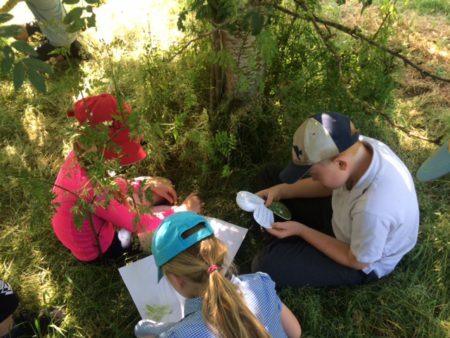 Outdoor Club have been making the most of the lovely weather and this week went out to identify tree species in the woods behind school. 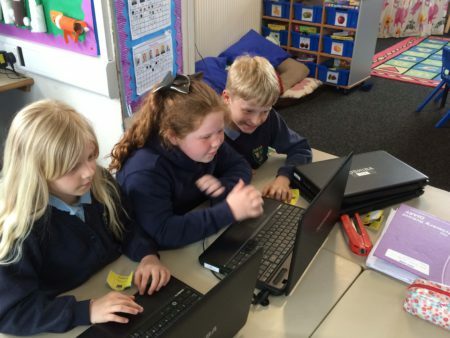 Tuesday lunchtimes are a busy time at Miss Coutts’ computer club. 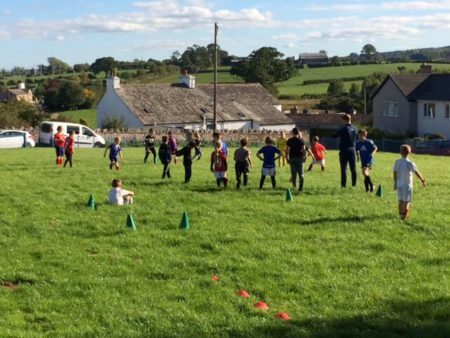 So far this term the weather has been perfect for our new outdoor club. We started by tidying the school garden and getting it ready for the summer. Thanks to Emma and Heidi for helping. 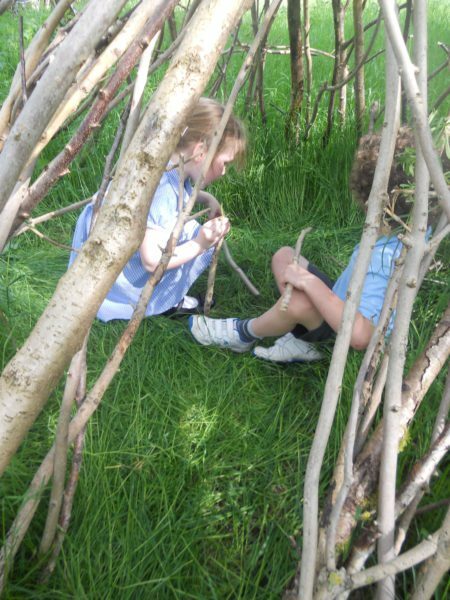 The following week we set off through the woods to look at the dens Class 1 had made and collected branches for building dens in the Secret Garden. 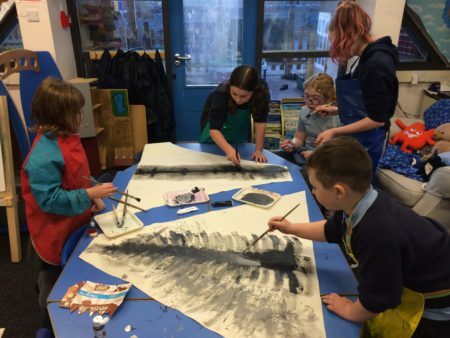 The children had their own suggestions for what they wanted to do this half term in art club. 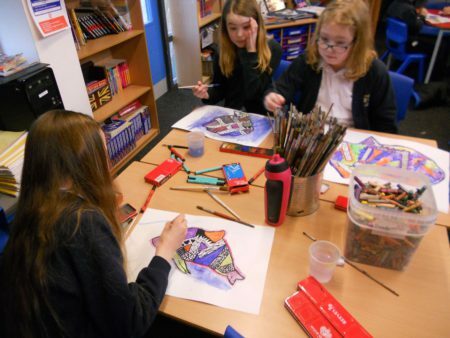 Over the last two weeks we have combined two of their ideas to create some colourful sea creature pictures using a range of different media.